Consider it luck, skill, or just plain determination: Captain Eddie Rickenbacker survived, by his own count, 135 brushes with death before finally succumbing at the respectable age of 82. He flew numerous combat missions in World War 1 and survived multiple serious airplane crashes after the war. Learn more about the dangerous, yet exciting feats of this great aviator who was regarded as the "Ace of Aces" in America. Consider it luck, skill, or just plain determination: Captain Eddie Rickenbacker survived, by his own count, 135 brushes with death before finally succumbing at the respectable age of 82. He flew numerous combat missions in World War 1 and survived multiple serious airplane crashes after the war. Learn more about the dangerous, yet exciting feats of this great aviator who was regarded as the “Ace of Aces” in America. Born on October 8, 1890, in a small town in Columbus, Ohio, Edward Rickenbacker lived a challenging life. He had seven siblings, and his parents were Swiss immigrants who decided to settle in the United States. His childhood was tough, being a child of a day laborer who earned just enough to feed the entire family. Eddie was also involved in mischief as a young boy though he never forgot the values his father instilled in him. At 5 years old, Eddie Rickenbacker started smoking and became the leader of the Horsehead Gang, a collection of mischevious youth from the town. His antics with the gang led to his first near-death experience at age 8. Rickenbacker, at the head of his gang, was riding a steel cart down into a gravel pit, when it flipped. After spilling him out, the cart landed on him, causing a serious cut on his leg, which exposed his bone and resulted in severe bleeding. Rickenbacker may have continued down the path to becoming a teenage ne-er do well if a tragedy hadn’t altered his path. His father was killed in a serious construction accident, and he was forced to step up and start working. Rickenbacker quit school and took on several jobs. He sold goat’s milk, eggs and newspapers, and the rest of the day, he worked at a glassmaking factory until he was exhausted. He also found employment in a shoe factory, foundry, and a brewery, so he could earn more money for the family. In his transition from a naughty little boy to a responsible teenager, Eddie Rickenbacker did all he could to become one of the major breadwinners for his family. During these early years, Eddie Rickenbacker also developed an interest in cars and their engines. He had an intense desire to drive a powerful and fast car of his own, and he was determined to make this happen. So, at the age of 16, he took a job for a race car driver named Lee Frayer. Eddie served as his mechanic, further refining his passion for engines and automobiles. Eventually, he began working at the Columbus Buggy Company as a salesman. When he wasn’t busy with work, he’d participate in races, occasionally winning prizes. He charmed the crowd with his daring and death defying moves and narrowly avoided serious injury in several accidents. As a dutiful son, he sent his mother a telegram after every car crash to let her know he was OK. 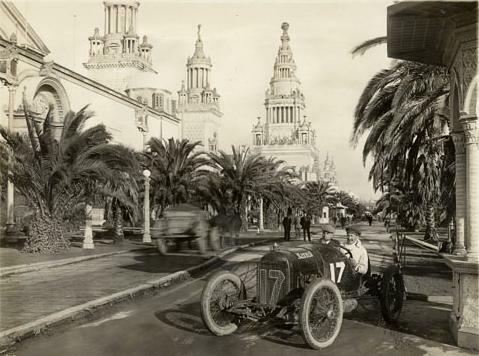 In 1914, Eddie joined a car racing event in Daytona, during which he set a world speed record: an impressive 134 mph. He continued to test his limits, racing in a variety of events, though things were about to change. Rickenbacker rode in an aircraft piloted by Glenn Martin, and suddenly, he had a new love. Battling a fear of heights, Rickenbacker was eventually able to start flying without problems in 1916. 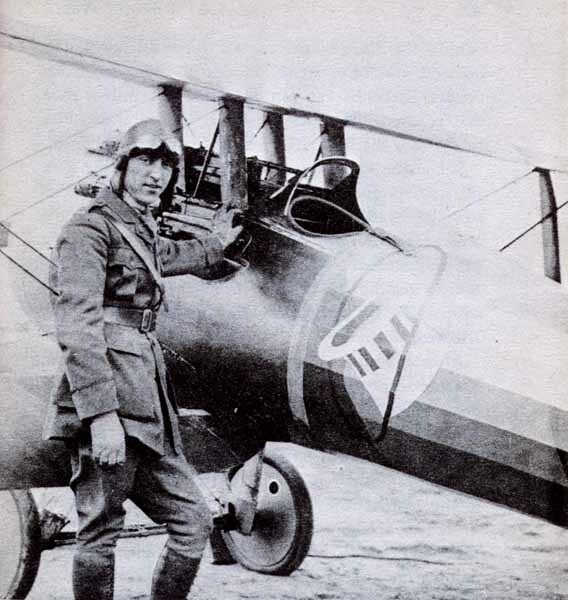 Eddie Rickenbacker wanted to expand his experience of flying even more, so he decided to volunteer as an aircraft pilot for America during World War I. However, some challenges stood in his way. He didn’t hold a college degree, and he was already 27, which meant he could not qualify for flight training because of age restrictions. But these factors did not stop Eddie from continuing to try, and he finally earned the approval of Colonel William Mitchell to become a student pilot. Rickenbacker proved himself as a determined pilot, and he graduated after training for 17 days. His first assignment was as a lieutenant for the 94th Aero Squadron, a team based out of Toul, in France. This was the very first fighter squadron that was trained by Americans, and they flew the Nieuport 28 biplane. Rickenbacker’s experience being a part of the squadron started off in a difficult manner. Most of the squadron members were graduates from Ivy League Schools, and they looked down on him. Despite the lack of acceptance from the squadron members, Rickenbacker did not allow their treatment of him get in the way of pursuing his dreams. He worked on aircraft engines and continued improving his flight skills while also working on ridding himself of his fear of heights. He was inspired by Major Raoul Lufbery, his first training officer, and soon developed his very own fighting techniques while piloting the aircraft. As he continually improved his aerial fighting skills, he also became more and more victorious during his missions. Slowly, his squad mates began to accept him. Rickenbacker perfected the technique of getting as close as possible to his target before he fired his guns. While this was overall a successful technique, there were instances when his guns would jam and fail to fire right away. Rickenbacker shot down his first plane on April 29, 1918. A month later, on May 28th, he shot down his fifth, qualifying him for “ace” status and earning him the French Croix de Guerre. On May 30th, he scored his sixth victory, but it would be his last for a number of weeks. He developed an intensely painful ear infection and traveled to Paris for treatment. After treatment and recovery, he returned to his squadron on the 31st of July, in 1918. During a flight on September 14, Rickenbacker successfully shot down a Fokker D.VII, Germany’s imposing new fighter plane. The next day, he shot down another. On September 24th, he was promoted to Captain of the squadron, and then next day, shot down two additional German fighters. For these victories, Rickenbacker was later awarded the Medal of Honor in 1931 by President Herbert Hoover. Captain Eddie Rickenbacker continued to earn victories, all the wild evading disaster. Rickenbacker survived numerous crash landings and near-death moments, including one time when his plane’s fuselage was riddled with bullet holes and one half of his propeller was shot off. One bullet came so close his helmet was slightly scorched. Rickenbacker ended the war with 26 victories, 13 of which were against Fokker D.VII’s. He reportedly flew 300 combat hours during the war, more than any other American pilot. During his service, he was the most successful American fighter pilot, and was declared the “Ace of Aces”. He was not very happy about being given this title, however, as others that had been awarded this title before had since been killed. In spite of his accomplishments, Rickenbacker remained a down-to-earth and simple man. He refused all offers by advertising companies to endorse products or to act in small roles on the silver screen. Upon leaving active duty, Rickenbacker was a major, yet he continued to call himself a captain. He believed that his duty as a captain was one of his finest, and he earned this title from his efforts and experiences. After serving as a fighter pilot, Rickenbacker decided to explore the field of automobile manufacturing. in 1920, he founded the Rickenbacker Motor Company and served as the director of sales and vice president. In 1922, the very first designs by the company were introduced in Detroit. Their cars had four-wheel brake systems, a feature new to automobiles. In part due to bad publicity from other car manufacturers who were worried they wouldn’t be able to sell their two wheel breaking models, Rickenbacker had trouble making sales. In should be noted that Eddie Rickenbacker also married Adelaide Frost Durant in 1922, a marriage that lasted 51 years, until old age parted them. The newspaper boldly declared “Love Catches Up at Last with Eddie Rickenbacker’s Heart.” Adelaide, said to be as independent and strong-willed as Rickenbacker, was a good match for him, and he credited her with saving his life at least twice. By 1927, the company went bankrupt. Rickenbacker himself also went personally bankrupt, and though he was not legally required to do so, he vowed he would repay the $250,000 he owed. Eddie Rickenbacker, with financial aid from a friend, was soon back on his feet. To start, he bought most of the Indianapolis Motor Speedway’s common stock, becoming the Speedway’s president. Using revenue generated by the speedway, he planned to start making money to pay off his debts. But this wasn’t all. Another source of income was royalties from the book he published entitled Fighting the Flying Circus, which delved into his personal accounts as a fighter pilot during World War I. He also created Ace Drummond in 1935, a popular comic strip that ran in about 135 newspapers nationwide, and was adapted into a movie serial. Finally, he took a position as head of sales with General Motors for Cadillac and La Salle automobiles. Through his position with GM, he convinced them to buy North American Aviation, a conglomerate whose assets included Eastern Air Transport. In 1935, GM asked Rickenbacker to step in and manage Eastern Air. With some help from friends, Rickenbacker then merged Easter Air Transport and Florida Airways to form Eastern Air Lines. In 1938, after learning GM was interested is selling Eastern Air Lines, Rickenbacker convinced them to sell the Eastern to him for 3.5 million dollars. Eddie Rickenbacker became heavily involved in commercial aviation, negotiating deals with the US Government, supporting the design of new aircraft, and outfitting Eastern Air Line with newer, larger and faster airliners. And though Rickenbacker ran the airline effectively, his management style was not appreciated by all. Many people were turned off by the cutting and acid manner in which he would criticize the failings of subordinates, both in public and private. He also was never able to reconcile himself to the idea of women working for the airlines and even hired male stewards when possible. He worked tirelessly seven days a week, demanded his employees work Saturday, was fanatic about punctuality, and was accused of being a penny-pincher. In spite of this, he was said to be loyal to his employees, never overpaid himself (he apparently set his salary at $50,000 a year in 1938, where it remained for the next 25 years), and was able to make on the spot, astute business decisions that built the airline into one of the nation’s four largest carriers at that time. During this time, Rickenbacker traveled extensively to various countries to promote and support aviation. And on February 26th, 1941, he had what may have been his closest brush with Death. On the 26th, the Douglas DC3 airliner Rickenbacker was on crashed just outside of Atlanta, Georgia. Rickenbacker suffered extensive and serious injuries, was soaked in fuel and trapped in the wreckage. Despite this, he encouraged other injured passengers around him, offering consolation to the injured and direction to those who were capable of helping. The passengers spent a long, terrible night at the crash site before rescue arrived the next morning. When rescue arrived, Rickenbacker was still conscious and in incredible pain, though he was unable to communicate with anyone. However, the rescuers didn’t know he was still alive and carted away several dead passengers before getting to him. Still under the impression he had perished, the press reported his death to the public. When his body arrived at the hospital, his injuries were so terrible and grotesque, the surgeons and physicians that saw his body left him for dead, instructing their assistants to “take care of the live ones.” Rickenbacker injuries included serious head trauma, including a fractured skull, a shattered left elbow and crushed nerve, a paralyzed left hand, several broken ribs, a crushed hip socket and severed nerve in his left hip, a pelvis that was broken in two places, a broken left knee, and a left eyeball that had been blown out of its socket. 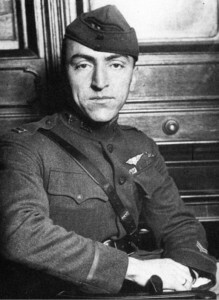 In his autobiography, Eddie Rickenbacker stated that he spent ten days at Death’s door, and during this time, he described “having an overwhelming sensation of calm and pleasure.” He further states that it took a supreme act of will on his part to stave off death, and return to the land of the living. This, according to Rickenbacker, was also the first time Adelaide personally saved his life. One night, as she slept nearby, his oxygen tent malfunctioned. She awoke, with the sense he was in terrible danger, and ran up a flight of stairs and down the hall to his room. There, she found he had torn apart his oxygen tent in his ferocious struggle to live and was beginning to suffocate. Adelaide discovered the attendant on duty had fallen asleep, and after making sure Rickenbacker’s tent was fixed, she exploded at the staff, yelling at them for their negligence. He spent months in the hospital recovering, followed by more time recovering at home, but amazingly, he eventually healed from his injuries, including regaining full eyesight. In 1942, Rickenbacker supported the war effort as a civilian, touring training bases in the US and England. He encouraged the American public to donate their time and money to the effort, and ever one to put his money where his mouth was, Rickenbacker made both Eastern Air Lines equipment and personnel available to the military. In October of 1942, after a successful trip to England, Secretary of War Henry L. Stimson sent Eddie Rickenbacker to the Pacific. Part of his trip to was to deliver a memorized, verbal message from President Roosevelt to General MacArthur. En-route from Honolulu to Canton Island in a B-17, the pilot got lost, and was forced to ditch the plane after running out of fuel. Of the eight onboard, only one was seriously injured while ditching the aircraft, though Rickenbacker was still recovering from the injuries suffered in the Atlanta crash. The men were able to recover three rafts, fishing kits, a few guns and some survival rations from the rapidly sinking bomber. They lashed the rafts together with ropes to provide a clearer target for search planes and then waited. The next 22 days were a survival saga straight out of the books. Though they were overdue in Canton, no one knew where to look for them. The rations went quickly, and they only had a few oranges and occasional rainwater for liquid. They caught the rainwater both in Rickenbacker’s felt hat and a bucket they had salvaged and supplemented what they caught by wringing out their clothes into the bucket as well. And though they had managed to grab some guns, the salt water corroded them to the point that they wouldn’t fire when some birds appeared overhead. They were able to catch a shark with one of the fishing lines, but the shark tasted so terrible that no one was able to keep it down. They also managed to catch an occasional fish, which would be divided equally among all the men. But as the days dragged on, they slowly began to starve, and worried about the sharks, constantly slipping through the water underneath their rafts and occasionally bumping up against them. And if that weren’t enough, a third ‘S,’ sunburn, continued to intensify their misery. At one point, one of them men attempted suicide by jumping out of the raft to drown, reasoning it would give the rest of them a better chance at survival. Rickenbacker, viewing this as cowardice, hauled the man back into the raft. He began to berate the men for giving up hope, and would continue to criticize them on a daily basis. Finally, one day, as it appeared all was lost, a sea swallow landed on Rickenbacker’s hat. He was able to catch the bird, and it was swiftly killed, de-feathered, and split into equal portions. Its guts were also used for fishing bait. Rickenbacker took this as a sign that they would survive, and they should not lose faith. Shortly after this, one of the men died, and the others buried him at sea. Despite the sustenance provided by the bird, the men continued to grow weaker. Rickenbacker’s continued use of sarcasm and ridicule to keep the men in line and attempt to keep spirits up might not have won him any friends, but it may have saved lives. Rickenbacker later learned that several of the other survivors swore an oath that they would continue living, if only long enough to have the pleasure of burying him at sea. After the second week stranded at sea, the survivors had several frustrating encounters during which search planes flew nearby, but failed to notice them. Eventually, is was decided the three rafts should split up, in an effort to make it more likely to be spotted by a plane. It is here that Rickenbacker credits Adelaide with saving his life a second time. Unbeknownst to the survivors, the newspapers had declared them dead (the second time for Rickenbacker), and the Army Air Corps was ready to give up. But Adelaide, sure that her husband was still alive, personally approached General “Hap” Arnold and convinced him to keep searching. Though he could have immediately returned home, Rickenbacker insisted on continuing to his destination, to deliver the message to General MacArthur. After that, he returned to the States and made extensive recommendations to Secretary Stimson about safety equipment that should be immediately put into use. Among his recommendations were adding a rubber tarp to the rafts to both protect occupants from the sun and catch rain water, and the addition of small seawater distilling kits. At the age of 73, Eddie Rickenbacker finally decided it was time for him to retire from aviation. He and his wife initially settled in a ranch in Texas, but after five years, its remote location motivated them to move. Rickenbacker donated this small ranch to the Boy Scouts and temporarily moved to New York City. Finally, the couple found a more suitable home in Coral Gables and stayed there until Rickenbacker suffered – and survived – a stroke in 1972. Rickenbacker recovered from the stroke and after regaining enough strength to travel, he went to Switzerland, seeking medical help for his ailing wife. Unfortunately, while there, he contracted pneumonia and died, on July 23, 1973. Rickenbacker’s ashes were buried in the family plot in his hometown, right next to his mother’s. Respected fellow aviator and colleague General James “Jimmy” Doolittle gave the eulogy at the funeral, and four jet fighters flew overhead to pay tribute to this beloved fighter pilot. Captain Eddie Rickenbacker lived a meaningful and fulfilling life as a businessman, fighter pilot, speaker, author, and philanthropist. He served the country to his utmost during the war, gained the respect of his squadron mates, and never stopped believing in his dreams. In everything he did, his faith, perseverance, patriotism and confidence fueled his actions that eventually resulted in success. Indeed, he did not allow fear or defeat to conquer his soul and fought his way out of Death’s grasp time and again, pouring himself into living the fullest life he could. I can give you a six-word formula for success: Think things through – then follow through. United States Army Center of Military History.